Paul Robeson was a black American man and an important civil rights activist of the early to mid 1900s, but there is so much more to this story. Until hearing Jeff Sparrow’s impassioned presentation at his recent Melbourne book promotion, my own knowledge of Robeson was embarrassingly limited. Firstly there were memories of my late father’s old records riddled with the rampant snap and crackle of static, Robeson’s voice rumbling through his signature tune of ‘Ole Man River’; and secondly, me, being a Billie Holiday fan, reading somewhere that Robeson disliked the song `Strange Fruit’– once performed by Holiday – Robeson labelling it `defeatist’… a song that tells the story of the murderous lynching of American Negros in the deep south of the 1930s, a shocking vision of black bodies hanging from poplar trees. Those were the times in which Robeson lived. Sparrow, a Melbourne writer and broadcaster, once worked in a city trade union co-operative selling second-hand books from deceased estates, thereby becoming acquainted with the reading habits of the recently dead through their donated literary collections. And there were always books about Robeson, a younger Jeff Sparrow inhaling the legend in dribs and drabs, while surrounded by those boxes of books. Paul LeRoy Bustill Robeson was born in 1898, in Princeton, New Jersey, the youngest of five children, his father an escaped slave who had become a preacher and instilled in his son the importance of education; that he was not alone and should strive to be a good example to his people, no matter the brutalisation and humiliation dished out to him. Robeson adored his father and did not let him down, winning a scholarship and attending an all-white university; this in the days of the Ku Klux Klan, racial segregation and the horrendous lynchings depicted in `Strange Fruit’, Robeson growing into an imposing man at 190cm tall, an acclaimed American football and basketball player, a Shakespearean actor, a legendary bass-baritone singer, and mastering over twenty languages including Chinese and Yiddish, along with European and African tongues. Robeson married Eslanda Cardozo Goode in 1921 and would raise one son. He completed a Columbia Law School degree in 1923, another remarkable feat for an American black man at that time. In addition to the United States, Sparrow’s quest takes him to meet Robeson contacts in the USSR, Spain, London and Wales, a long-term connection between Robeson and Wales beginning in 1929, Robeson meeting a group of destitute Welsh miners having walked to London, their union broken after the collapse of the 1926 general strike and the onset of The Great Depression. Robeson’s continuing commitment to social issues continued through the 1930s, becoming interested in economics and politics, travelling to the Soviet Union extolling its apparent lack of racial bias while being openly critical of the inequality and racial cruelty in the USA. 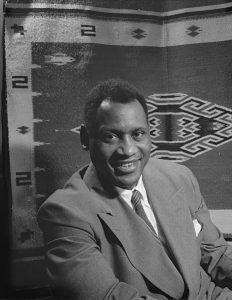 Robeson continued to campaign for leftist ideals and civil rights around the world, with Sparrow following Robeson to Spain, and the once-battlefields of the 1937-1939 Civil War, the writer mingling with the ghosts of the past to render a tangible account of the murderous excesses of the day, and Robeson’s passionate allegiance to the Republican cause. In an early 1940s New York, Robeson played Othello in the longest running Shakespeare play in the history of Broadway, yet another groundbreaking feat for a black man. After the Second World War, and with the onset of the Cold War, both Robesons were forced to testify before the McCarthy `House Un-American Activities Committee’. The Robesons refused to sign an affidavit declaring that they were not communists, although never having joined the party. Robeson was blacklisted, subsequently unable to find work, his passport revoked, and his income reduced to a trickle. For the next ten years the Robesons were slandered, intimidated and subjected to the constant threat of mob violence. With the restoration of his passport in 1958, an emotionally scarred Robson undertook several worldwide comeback tours. Sparrow has followed in the footsteps of Robeson and compiled a heartfelt biography, always referring to Robeson by his Christian name, the irony being that Sparrow found little public knowledge of Robeson in his home country, the United States. And there is another mystery here, with Robeson attempting suicide on several occasions, once found on a Moscow bathroom floor after suffering hallucinations and a severe bout of depression, his son later questioning the doctors’ use of drugs and shock treatment. Sparrow offers a comprehensive account of Robeson’s demise. By 1976, even Robeson must have despaired of his 1930s vision of a USSR free of prejudice, with Sparrow left wondering what Robeson’s years of sacrifice actually meant to him in the end. Whatever the cause of Robeson’s deterioration in body and soul, he never fully recovered, becoming increasingly frail and disillusioned, destined to die in 1976, after succumbing to a stroke at age 77yo. Sparrow’s research is thorough, the style sympathetic and observational, the interweaving of the American Civil Rights movement cleverly dealt with, as are the many personal interviews with his Robeson contacts. There are other Robeson biographies of course, including one written by his wife – and an autobiography – but with Sparrow’s latest effort he may well capture a previously unknowing audience, this warm and well-written work often fascinating, each chapter instilled with an obvious passion for his subject, the lot of a flawed but charismatic man somehow largely forgotten in the public eye, dispossessed of his deserved fame by the divisive but lingering McCarthyism of 1950s America. 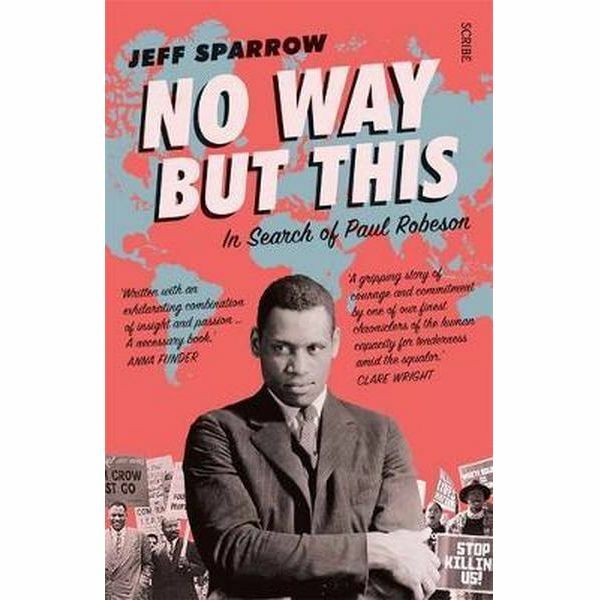 ‘No way but this’ is a compulsory read for anyone with an interest in Robeson, civil rights, injustice, or the human condition, Jeff Sparrow’s journey particularly poignant when dealing with the catalyst for embarking on this book – that being Robeson’s empathy for the lot of Australian Aborigines, the great man visiting here in 1960 to sing for blue-collar construction workers at the site of the Sydney Opera House. I admire black Americans’ civil right movement but I did not know much about Robinson, Thank you for your review. Very informative! a man very much committed to the cause. I too was intrigued, especially with the Australian connection. I think he was quite well known in artistic and liberal political circles here in the USA. Known and admired. Your review makes me want to read the book. A book well worth the read, so very glad the review piqued your interest. Ian i thought your review on ‘Remembering Paul Robeson’ an in depth contemplative fascinating reflection presenting a sensitive man of many talents and reveals light and shade in your description of a highly emotional person striving, or perhaps struggling, to come to terms with injustice encountered in his life. A great lead up of information Jeff Sparrow will have elaborated on in more finite detail as his book will allow. Succinct review and i wish the author all the best. Thanks for reading & taking the time to comment. Terrific book review. Embarrassed to say I knew very little about Robeson, but what a life he lead! It is always sad to find someone with so many achievements become defeated and depressed at the end of a life well lived. I am inspired by his story. Thanks for your thoughtful review. P.S. Mastering 20 languages? I’m still struggling with one! The author Jeff Sparrow thought Robeson to be little known in the USA these days… so you are certainly not alone on that one. & I know what you mean about mastering all those languages. Mind-boggling. My Dad had an RAAF posting with the USAF during the mid to late ‘50s. I remember them buying lots of big LPs, mainly Rogers and Hammerstein new musicals; but I do remember a Paul Robeson LP that I am now very impressed that they bought while over there. I’d like to think it was good old Aussie egalitarianism and going for the underdog. I might even still have it! It seems we have that LP in common David… or at least a strong memory of it. Great book review! Robeson sounds like an interesting man. I’ll have to explore this book further. Glad you liked the review, & hope you find the time to fully explore the book. Great review Ian. Easy to read and even though it is not something I would normally read about, it certainly kept my interest. Keep going with the good work. A fascinating story through to the end. I did think the Spain connection may resonate. dear Ian, thanks for sharing this. i’m going to tweet it as Jeff Sparrow is known in my network, but not for his interest in Robeson. My mum would be thrilled that Robeson is getting new air play. Although my father was a big fan of Robeson’s incredible voice – just like your mum – I wonder how much he actually knew of the man. Alas, I’m afraid I will never know. Ian, that is an interesting book review. It is for the first time I am reading about Robeson, but by the time I finished reading the book review, it was as if I have known him for ever, his early days, the scholastic achievements, the meanderings, the witch hunts from which he never recovered, which says a lot about the book written by Jeff Sparrow, and which says a lot about your power to compress an entire world in a fistful of words. The author appears to have been truly moved by his subject, following his historical footsteps all over the globe in search of information. In the process, we learn a lot about the rather interesting life of the author too. Thank you for the glimpse of the excellent biography of Robeson. It is indeed an incredible story & a `must read’, Sparrow obviously very close to his subject. Sounds like a fascinating character, and one whom I had not previously heard of. Interesting to see his connection with the plight of the Australian Aboriginal people too. The Australian link surprised me too, as with nearly everything about the man. Nice book review about a very interesting man. So much more to the man than I had imagined, that’s for sure. A fascinating man, to be sure. Nice review, too. Especially in the context of those times. Yes, it is quite a story, especially with the Australian connection. I’m so glad the review sparked your interest.